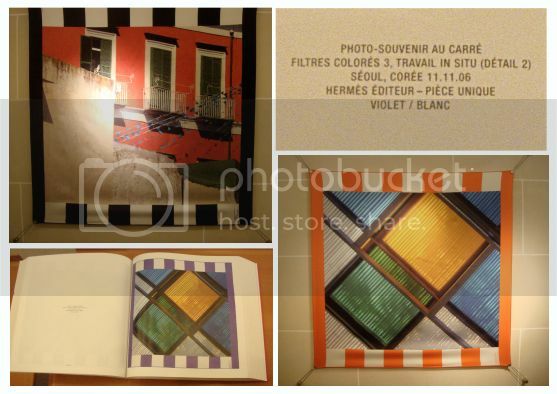 .. and the limited edtion 'Photos-souvenirs au carré' Carrés displayed at FSH, a result of Hermes' collaboration with french artist Daniel Buren. 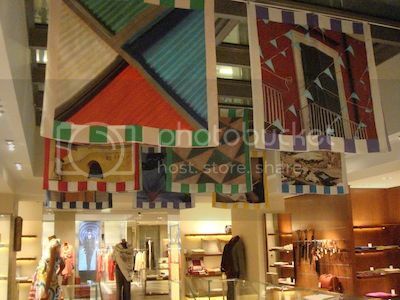 The scarves are ink-jet instead of screen printed, allowing a most realistic reproduction of Buren's 'photo souvenirs' art works. Ending the day with a glass of champagne at the Train Bleu, while waiting for the train back home, wearing 'La Femme aux Semelles de Vent' in the basic bias fold, held in place by a black MT scarf fur collar. I have Le Train Bleu on my "must see" list for our next Paris visit in May 2011. It looks fabulous! Oh, and after salivating over your fur collars and scarf rings for months, I've finally purchased one of each. Ah Paris...Champagne and le Train Bleu, all the beautiful pictures make me miss home even more. Ok, I won't refrain myself...WHAT IS IN THE H BAG????? Paris in May, how wonderful, Deja Pseu! Have fun planning your trip, and a great time at the TB. Many thanks for your order, wishing you much enjoyment with your fur collar and scarf ring! Such beautiful sights as always from your trips to Paris and the pups are so cute!! I was just going to ask about what was in the bag,but it looks like I am late to the dance! Sounds like it could be a new pair of brown jumping boots...now that would have me jumping for joy,too! Bingo, dear Trudye! Between you ladies, my little puzzle was discovered and solved rather quickly! You are right on the colour too, even though for a milli second, I was torn between the moca and rouge h... then I thought of 'our' leather jacket (and also the GP, modulation etc) and it became an easy decision in the end! Ah ha...I knew it! Soo...looking forward to your modeling shots! I can think of a million different ways they will work with your wardrobe AND mine!! Lucky girl! Aww, many thanks dear Trudye. We must be twins separated by birth, you always know what I'm up too.. the boot babies will come into v good use, soon you'll be all tired of seeing them! 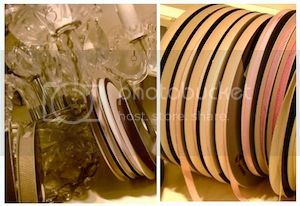 I just love the amazing boutiques you've featured in your post. I must check them out on my next visit to Paris. Thank you for sharing the pics of your trip to Paris with us. And congrats on the mocha JB! I can't wait to see them in action. 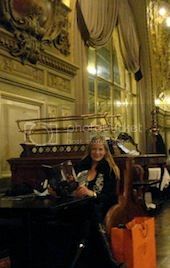 How I wish I had enjoyed a glass of champagne with you at Le Train Bleu! Paris is beautiful!!! Congratulations on your new boots! I do look forward to seeing them! May I ask, dear MaiTai, the name of the shop that sells the beautiful ribbons? Warm hugs, M.
WEeee think thows Paris Chewowas look a bit gerly. CAn you plees tak fotos of the Chewowas hoo ware leather and spikes and chains and stuff. Bingo on the JBs, my dear Jamais! Trudye is eagle eyed and winged, one day she’ll beat me to my posts, lol! The race is worth it though, as there are crates of champagne on the finishing line. Chin chin! Thank you, my dear sushi queen. Sad that the visit to FSH was not quite as successful as I hoped, but will borrow Trudye’s eagle eyes and keep on looking! You are so right on Paris, dearest Scarf Enthusiast! So happy you enjoyed the pics. Went past D, and checked our table, and our cake is waiting for us too! I was truly blown away by the DB scarves, I could not have imagined ink printing to be that stunning. Thank you for welcoming the JBs, it was such a happy moment putting them next to the black ones! Thank you, Chocolate, Cookies and Candies! Your comment reminds me that I must add the addresses to the post, thanks! Paris in January, we’re on, DD! Thank you also for your sweet compliments re the JBs, it was quite a rocky road before I finally got the right pair. The Champy shop is at the top of Rue St Sulpice in St. Germain, will try and find the house number. As for the silks, they made only 365 pcs in total, featuring 22 designs. The price was similar to the Albers scarf back then, including the book they are 5000 EUR, I think. 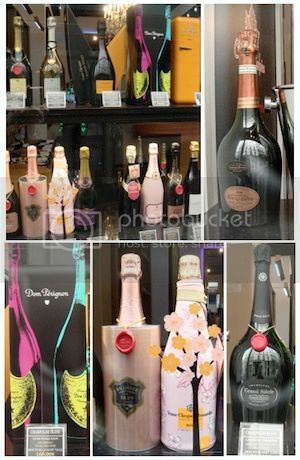 Don’t remember for sure, the only thing I do know that they were too expensive pour moi! Nothing beats the cool of Archie and Siggi, dear Louise! I might stroll around Pigalle next time, to see if I can snap something interesting for the Dodgy bros. Archie and Siggi rock!! OK, my new year’s resolution is to have champagne with Manuela and Macs in Paris in 2011! Who else would like to join? Thank you, dear MaiTai! What a wonderful new year decision! I hope it comes true and we can meet in Paris in 2011! Big hug, M.
Buren's scarves look fascinating. New jumping boots? Lovely! Le Train Bleu awakens fond memories.